M3&M2 micro fc adapter 30.5mm to 20mm by Lefty9 is licensed under the Creative Commons - Attribution - Non-Commercial - Share Alike license. 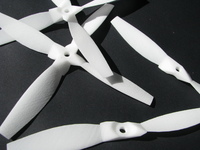 Various m2 and m3 adapters for micro flight controllers from 30.5x30.5mm pattern to 20x20mm. The MK1 and MK2 have a cutout on one arm specially designed to fit the piko blx ,or any other micro fc that has the dsmx and usb port on the top and bottom, in order to sit flush in the mount. The MK3 is a more generic type that can also fit the piko blx but will not do if you are usingthe dsmx port. All V1's need support except the Mk4, which prints as it is. Say thanks by giving Lefty9 a tip and help them continue to share amazing Things with the Thingiverse community. Say thanks and help Lefty9 continue to share amazing Things with the Thingiverse community. You'll need a PayPal account to tip Lefty9. Click the button below and you will be redirected to PayPal. Once the payment is complete, you'll be brought back to Thingiverse.